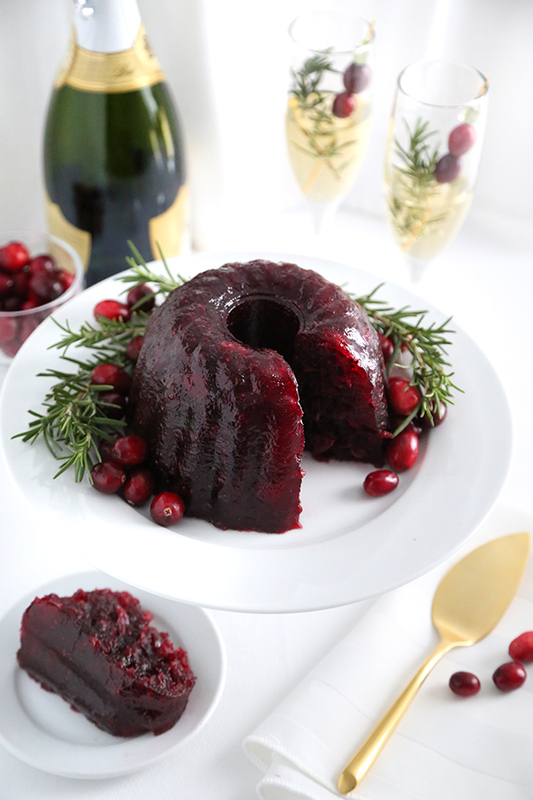 Toast-worthy champagne cranberry sauce molded into a ring doubles as table decor for formal Thanksgiving dinners. It's tart and sweet ,which pairs perfectly with savory main dishes. Cheers to you, friends - with cranberry sauce! Are you ready for Thanksgiving? Our menu is almost set, with just a few minor adjustments to be made. One thing is for certain, we'll have enough food for twice the people attending, which is good for those of us looking forward to leftovers! 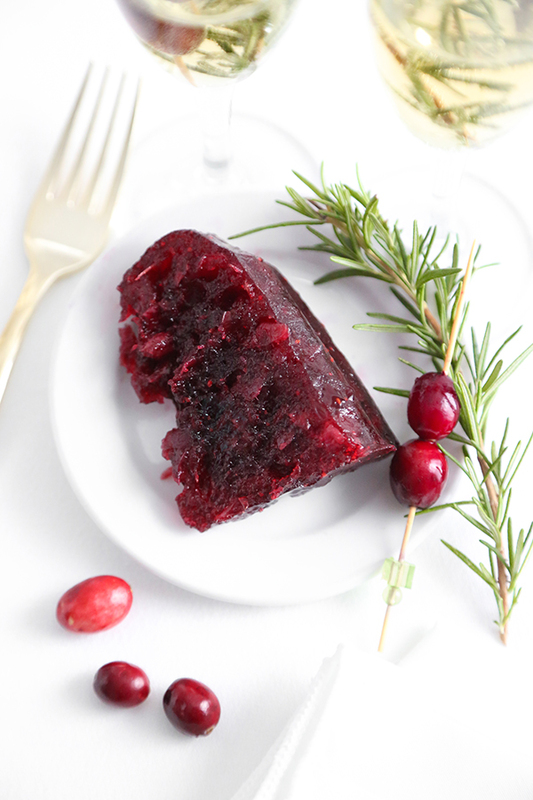 This slightly boozy cranberry sauce is tart and delicious with savory fare. It can be served as sauce in a bowl, or if you're looking for a more formal presentation, you can mold it in a decorative pan as I have. Fresh or frozen cranberries can be used for this recipe. Apparently there's a cranberry surplus this year, so you should have no problem finding either! Cook the berries in a big pot with sugar and champagne and just a pinch of salt. After about 25 minutes, the berries will have cooked down with the sugar to a jam consistency. At this point, you could pour the sauce in a bowl and be done with it! If you're looking to mold the sauce, then measure out 3 3/4 cups of the sauce to a 4 cup measure. Add 1/4 cup additional champagne to the sauce to bring the amount to 4 cups. Stir in unflavored gelatin, and then pour in a mold. I used this 1/2 liter pudding mold, which you may recognize from waaaay back when I made steamed pudding, or even this classic gingerbread recipe. You can use any 4 cup mold you wish, or even pour it in a small loaf pan. The color of the cranberry really comes out - it practically glows red - when the mold is cut. The sugar content in this recipe may seem high, but fresh cranberries are extremely tart and they require a good amount of sweetness to counter that. I think you'll find the finished product well-balanced, but still tips more to the tart side than sweet (as good cranberry sauce should!). In a large sauce pan over medium high heat, combine cranberries, sugar, salt and 1 1/4 cups of the champagne. Bring mixture to a boil, then reduce heat to medium low and simmer. Stir occasionally, until the sauce thickens and cranberries have burst, for 25 to 35 minutes. Measure out 3 3/4 cups (880 ml) of the sauce, and add the remaining quarter cup (60 ml) of champagne to the sauce to make the mixture an even 4 cups (950 ml). Meanwhile, heat the gelatin in microwave until liquid, about 30 seconds. Stir into the sauce until ingredients are thoroughly mixed. 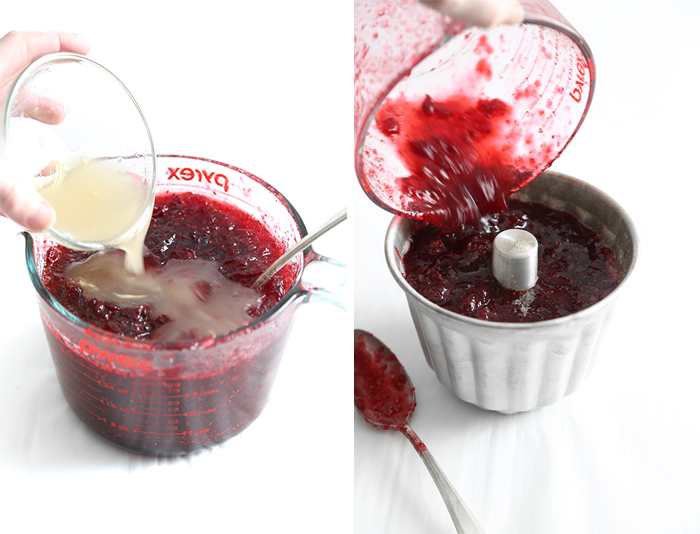 Lightly coat the inside of a ceramic cranberry mold or 4 cup fluted baking pan with non-stick cooking spray. 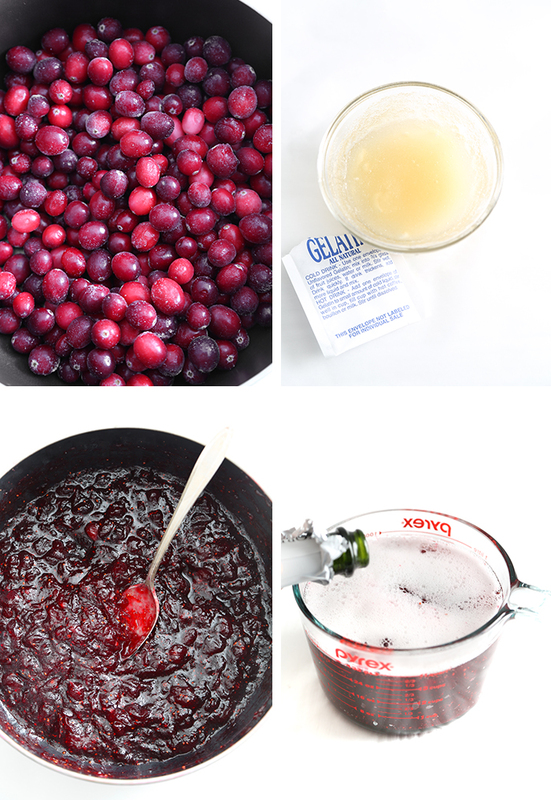 Pour the cranberry sauce mixture into the mold and let cool to room temperature, then cover loosely with plastic wrap and refrigerate for 8 hours, or overnight. To unmold the sauce, set the mold in a large bowl of warm water (about 115 °F) so the water almost reaches the rim of the mold. Let stand for 30 seconds, and then remove the mold from the water. Place a serving dish upside down on top of the mold and invert the platter and the mold together. Place on counter top or table and gently shake the mold until you hear the gelatin begin to release, then lift the mold; if gelatin does not release, replace the mold and return to the warm water for 15 seconds, then repeat the steps as directed above. 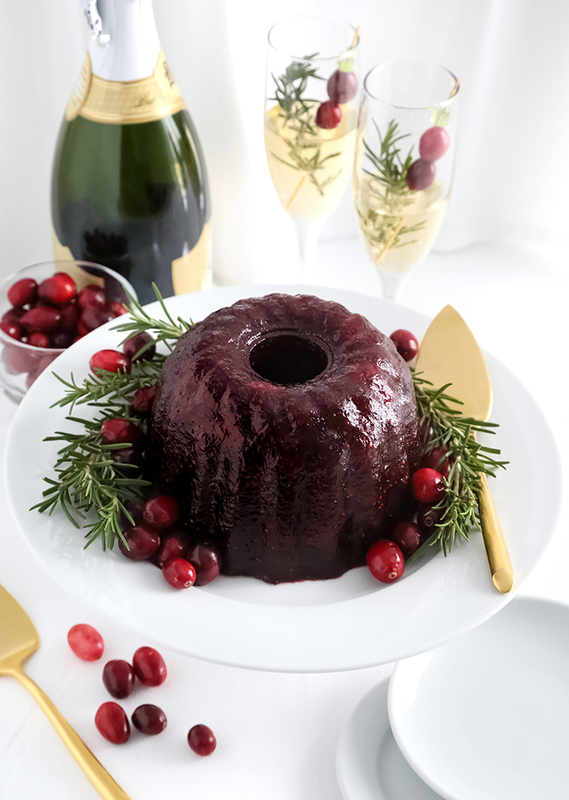 Serve cranberry mold surrounded with sprigs of rosemary and fresh cranberries. Thanks for this lovely looking recipe! I think maybe the "14-18 servings" is a bit much, though. Half-cup servings would be just 8. Hi Phillip! I must honestly say I've never eaten 1/2 cup of cranberry sauce in one go. Usually just 2-3 tablespoons on the side with the rest of the meal. I think the yield size may be relative. Thanks for your comment! I made this for our Thanksgiving dinner and it was absolutely fantastic! Everyone loved it. Thanks for all the great recipes and the inspiration you give me to be a creative baker.